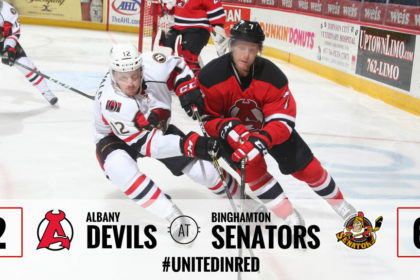 BINGHAMTON, NY – Four goals in the first five minutes of play was too big of a mountain for the Albany Devils to climb in their 6-2 loss against the Binghamton Senators Friday at Floyd L. Maines Veterans Memorial Arena. 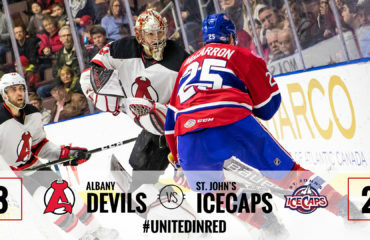 The setback ended the Devils’ three-game winning streak as they move to 9-5-0-0. The Senators improve to 4-8-0-1. 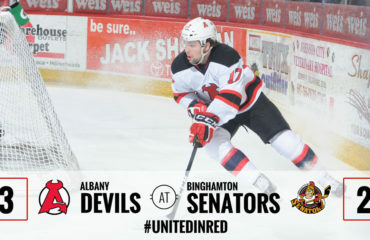 Albany’s goals came from Petr Straka and Brian Gibbons. 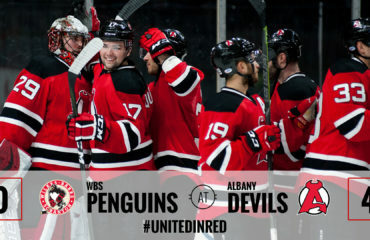 For Straka, who was acquired in a trade a week ago Saturday, scored his first goal as a Devil. Gibbons netted his third goal of the season and second in the last four outings. The Senators, who hadn’t registered more than two goals in the previous seven games, found the scoring touch early. Buddy Robinson scored 25 second into the game and Patrick Sieloff followed 14 ticks later. Robinson netted his second of the night at 2:38. After Scott Wedgewood replaced Mackenzie Blackwood in goal, Curtis Lazar scored at 4:56. In the second, Straka’s goal at 7:19 was setup by Vojtech Mozik and Miles Wood. Gibbins’ power-play tally at 16:17 had help from Joe Blandisi and Reece Scarlett. Wedgewood, who had come in relief, left the game near the midway point of the third period after making 15 saves on 16 shots. Blackwood was the goalie of record; he goes to 3-2-0 for the season. The Senators’ Matt O’Connor earned the win with 26 saves on 28 shots. 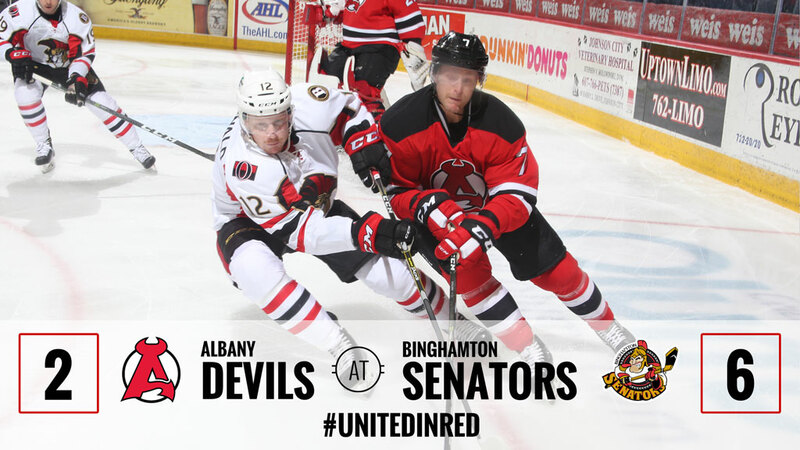 The Devils return to action Saturday with a 7 pm contest against the Syracuse Crunch at the War Memorial at Oncenter.